I have always wanted to try Breakout PH ever since I saw a post at WheninManila early last year. Despite its proximity to my work and my apartment, I still haven’t found the time to drop by and try their escape rooms myself. Most of my friends are pre-occupied with work, too, and I wouldn’t want anyone else to be teammates with anyway (clingy!). As my dreams of trying the escape rooms came to a halt, one of my fellow contributors at WIM posted an invite in our groups, to which I automatically said “I volunteer”. 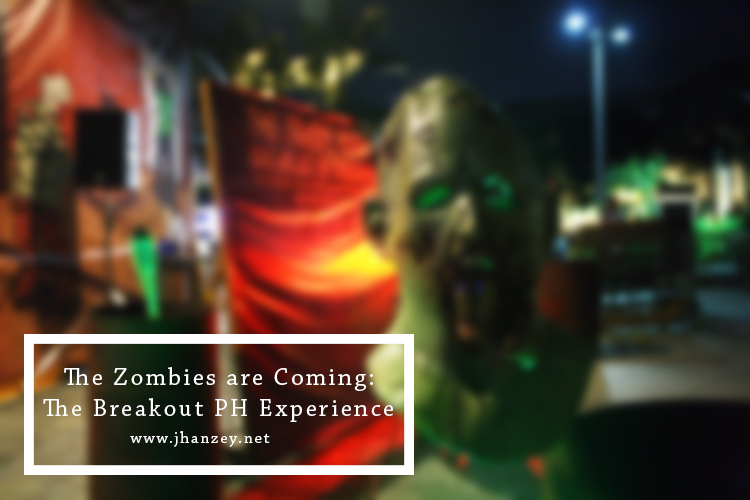 This was for their makeshift Zombie-Infested escape room at Trinoma, where you’ll get the chance to solve puzzles and find your way out under 30 minutes. I dragged Mark with me, and together with other bloggers, we entered the dark room with a thumping heart and game on faces. Thrilling was an understatement to explain how our experience went. Needless to say, there were a lot of screaming and screeches coming from me and my teammates. The clues were literally all over the place, some of them located at the most unexpected locations. It was crazy and mind-boggling, with my teammates and I slowly losing hope as we started to get stuck with a series of clues that looks like they meant something, but did not make sense to us. There were a lot of directions being asked to be done, a lot of questions that demanded answers, but our best seems like it wasn’t good enough, and we eventually ran out of time. We were able to cover only half of the game (according to our game marshall), despite feeling like it was an eternity. If this was zombie apocalypse, then that was the end of us. We had loads of fun, though, and despite coming out drenching in sweat, this experience is something that I would love to do all over again. You will be asked to sign a waiver. But of course, there are things that are meant to stay inside the four corners of the room, and the waiver pretty much says that everything must be left confidential. In other words, NO SPOILERS, PEOPLE. You will be asked to leave everything behind… which includes your bag, your gadgets, and your nervousness. I suggest that you bring in a bag so you can keep all your belongings together. For 30 minutes, you would be all by yourself, with a hanky in hand, and teammates to count on. Everything that you will need are provided inside the room, you just have to be on a lookout. You will be asked to check and observe every little detail. Everything inside the room can be touched and rearranged according to your will. Even the smallest piece of paper or trace of pen has to be taken into consideration. Don’t worry, though, you would be guided by a game marshall if there are things that are off-limits (like electrical wirings or something that might cause you danger) or if there are places that you have to avoid (like places where you can bump your head, etc). You will be asked to play as a team. The game is meant to accommodate teams, and involves a lot of complex puzzles that need the cooperation of each and every member. Physicals are not allowed. The zombies might terrify you, but you cannot touch them nor they cannot touch you. They are just there because you have to be scared (and trust me, you will be). 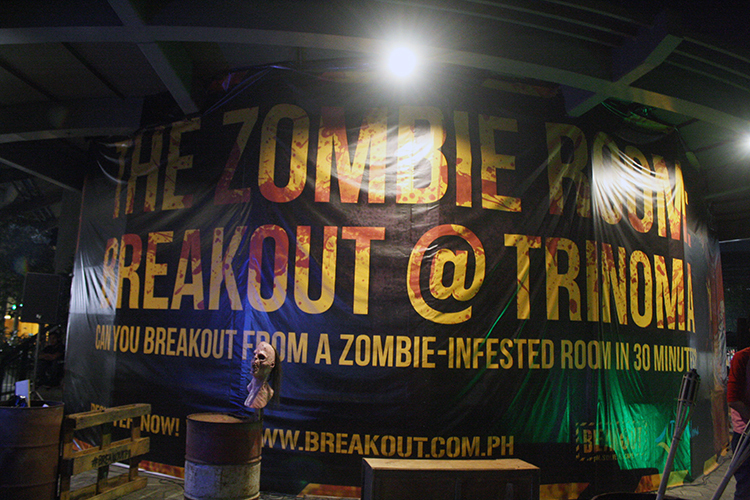 Breakout PH’s Zombie Room in Trinoma would be available for a limited time only. But in case you want more rooms and challenges, you can also check out their Paragon Plaza site. Being inside an escape room feels like being inside an insane video game with a much faster heart rate and more stress and thrill. 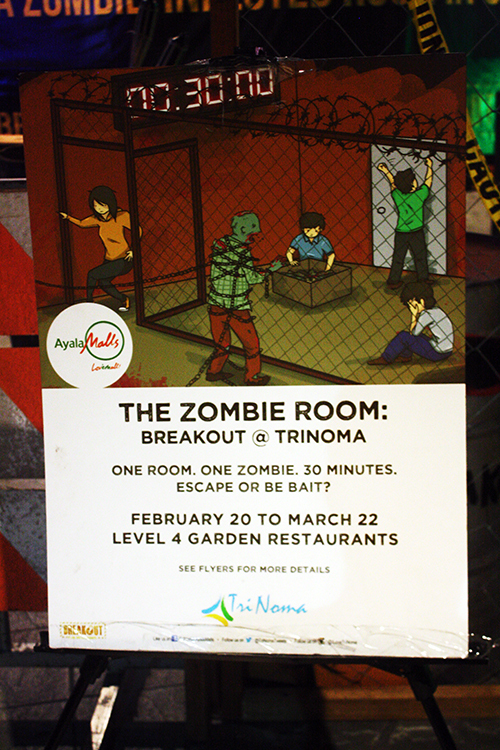 Don’t forget to pay a visit to their Trinoma Zombie Room, they’ll be there until March 22. Oh man, for me there's only one word that comes to mind — Nope! Haha, I'm such a scaredy-cat! I've never been able to go to these kinds of things, but it looks like you had fun! Ahhh sounds like FUN FUN FUN! I agree with Sarah, I wish there's a Zombie Breakout here in Cebu! I wish i was in PH to witness this kind of event. But at least you guys were able to figure it out! We got stuck and didn't got out, such a bummer! This one isn't a horror house, really. It's more like a live puzzle, where you have to figure out stuff to get out! 🙂 Super fun! When you're inside, adrenaline will take over you and you'll be able to move, I swear! 🙂 Go, go, go, try it sometime! I hope Breakout PH would open up in Cebu sometime soon so you guys could try it out too! You guys should try it out sometime. It IS fun!